Partager la publication "Analyze accelerometer data with Apache Spark and MLlib"
Apache Spark started as a research project at the University of California, Berkeley in 2009 and it is an open source project written mostly in Scala. In a nutshell, Apache Spark is a fast and general engine for large-scale data processing. Spark’s main property is in-memory processing, but you can also process data on disk and it can be fully integrated with Hadoop to process data from HDFS. Spark provides three main API, in Java, Scala and Python. In this post I chose the Java API. Spark offers an abstraction called resilient distributed datasets (RDDs), which are immutable and lazy data collections partitioned across the nodes of a cluster. MLlib is a standard component of Spark providing machine learning primitives on top of Spark which contains common algorithms (regression, classification, recommendation, optimization, clustering..), and also basic statistics and feature extraction functions. If you want to get a better look at Apache Spark and its ecosystem, just check out the web site Apache Spark and its documentation. Finally the Spark-Cassandra connector lets you expose Cassandra tables as Spark RDDs, and persist Spark RDDs into Cassandra tables, and execute arbitrary CQL queries within your Spark applications. The availability of acceleration sensors creates exciting new opportunities for data mining and predictive analytics applications. In this post, I will consider data from accelerometers to perform activity recognition. The data in my github account are already cleaned. Data come from 37 different users. Each user has recorded the activity he was performing. That is why something the data are not relevant and need to be cleaned. Some rows are empty in the original file, and some other are misrecorded. I have used labeled accelerometer data from users thanks to a device in their pocket during different activities (walking, sitting, jogging, ascending stairs, descending stairs, and standing). The plots below show characteristics for each activity. Because of the periodicity of such activities, a few seconds windows is sufficient to find specific characteristics for each activity. We observe repeating waves and peaks for the following repetitive activities walking, jogging, ascending stairs and descending stairs. The activities Upstairs and Downstairs are very similar, and there is no periodic behavior for more static activities like standing or sitting, but different amplitudes. I have pushed my data into Cassandra using the cql shell. Because I need to group my data by (user_id, activity) and then to sort them by timestamp, I decided to define the couple (user_id, activity) and timestamp, as a primary key. Just below, an example of what my data looks like. As you can imagine my data was not clean, and I needed to prepare them to extract my features from it. It is certainly the most time consuming part of the work, but also the more exciting for me. My data is contained in a csv file, and the data was acquired on different sequential days . So I needed to define the different recording intervals for each user and each activity. Thanks to these intervals, I have extracted windows on which I have computed my features. 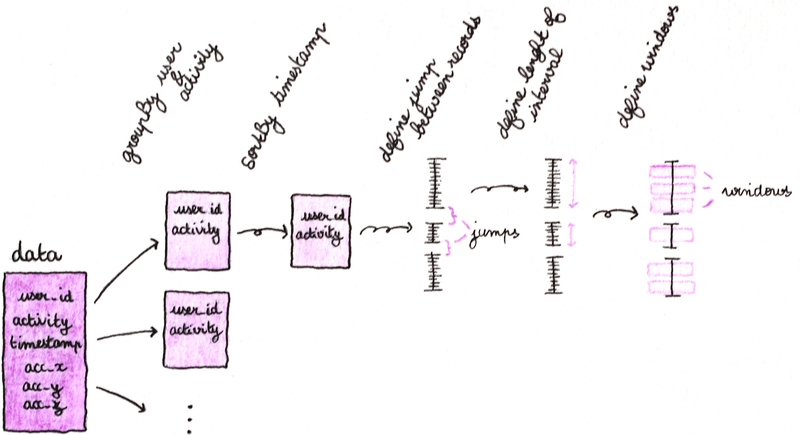 Here is a diagram to explain what I did and the code. First retrieve the data for each (user, activity) and sorted by timestamp. Then search for the jumps between the records in order to define my recording intervals and the number of windows per intervals. Each of these activities demonstrate characteristics that we will use to define the features of the model. For example, the plot for walking shows a series of high peaks for the y-axis spaced out approximately 0.5 seconds intervals, while it is rather a 0.25 seconds interval for jogging. We also notice that the range of the y-axis acceleration for jogging is greater than for walking, and so on. This analysis step is essential and takes time (again) to determine the best features to use for our model. Now let’s compute the features to build the predictive model! Just to recap, we want to determine the user’s activity from data where the possible activities are: walking, jogging, sitting, standing, downstairs and upstairs. So it is a classification problem. Here I have chosen the implementation of the Decision Trees algorithms using MLlib, to create my model and then to predict the activity performing by users. You could also use others algorithms such as Random Forest or Multinomial Logistic Regression (from Spark 1.3) available in MLlib. Remark: with the chosen features, prediction for “up” and “down” activities are pretty bad. One trick would be to define more relevant features to have a better prediction model. Below is the code that shows how to load our dataset, split it into training and testing datasets. Let’s use DecisionTree.trainClassifier to fit our model. After that the model is evaluated against the test dataset and an error is calculated to measure the algorithm accuracy. 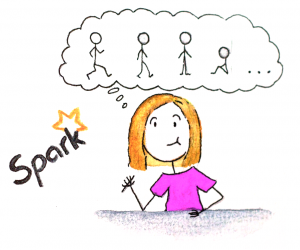 In this post we have first demonstrated how to use Apache Spark and Mllib to predict user’s physical activity. The features extraction step is pretty long, because you need to test and experiment to find the best features as possible. We also have to prepare the data and the data processing is long too, but exciting. If you find a better way/implementation to prepare the data or compute the features, do not hesitate to send a pull request or open an issue on github.